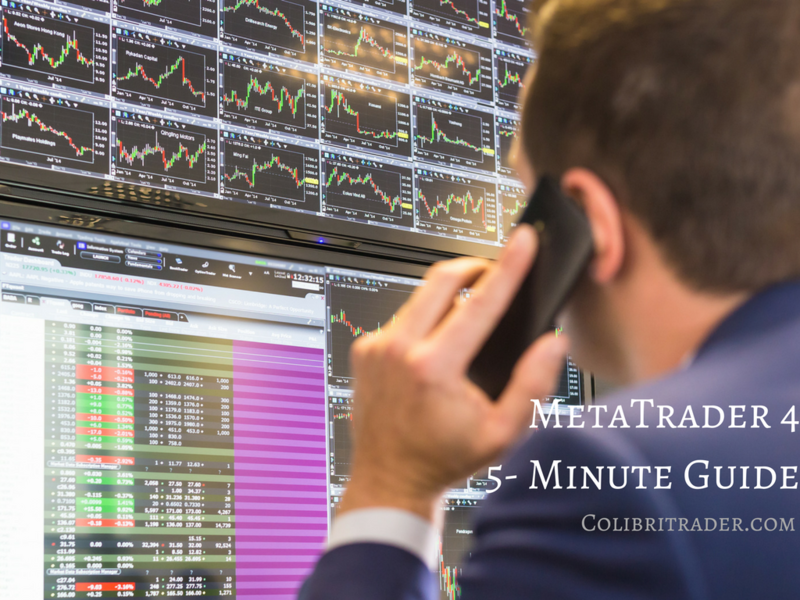 After a popular demand from many beginner traders, I have finally created quick guide on the MetaTrader 4 (MT4) trading platform. In this article, I am going to provide you with a tutorial on how to use the MetaTrader trading platform. As the world’s leading trading software, MT4 has all the features included that professional traders use every day for their chart analysis. When you install the software and open it for the first time, you will need to login with the MT4 login details that you received on email while registering for the software on my website. Choose the MT4 demo (unless you already have a live account) and click on “Next”. You will be asked to enter the login details (check your e-mail), and that’s it! Your MetaTrader 4 trading platform is all set-up. The next screenshot shows how the main user interface in the MT4 platform looks like. Your “Chart window” will most likely be black and green and cluttered with a variety of indicators, but you can (if you want to see what I see) easily change that by a right-clicking on the chart -> Properties -> and choose “Black On White” from the “color scheme” drop-down menu, and change the Grid color to “None”. As you are already aware, I am a protagonist of pure price-action trading and don’t use any of the indicators. Just right-click on an indicator and select “Remove” (if of course you want to see the markets the way I see them). Cool Tip: Save your chart properties as a template on MT4, so you can access the template whenever you need to in the future. To do this, right-click anywhere on the chart and select “Template” -> “Save Template”. NB: If you name the new MT4 template as “Default”, then all new charts that you open will automatically have the chart properties from the “Default” template. That’s it, now you should have a beautiful, clean, black&white chart window on your MT4 platform. At the top of the window, you will find the the “Toolbars” window. There are four toolbars that cover almost everything you will need in trading. Just below the “Market Watch” is the “Navigator” window. Here you will find a list of open MT4 accounts, expert advisors (a.k.a robots), indicators and scripts. Actually, we will not use this window much, as for price-action trading all we need is a pure, clean chart. Charts – This toolbar will display icons to manage your MT4 charts. Here you can change the type of chart (bar chart, candlestick or line chart), you can zoom-in or -out in the chart, cascade them or make that each price-tick moves the chart to the last candlestick. You can also shift the end of the chart from the right border, so it’s more easy for you to follow the most recent price-action. Line Studies – This toolbar will display icons to manage any objects to be imposed onto your charts. It is very useful for drawing support/resistance lines on the charts. You can select the crosshair (+) to see the exact price on the on the charts, or draw trendlines, channels, Fibonacci retracements, and add text and arrows for important chart events. You can use it to quickly spot the price of a specific currency pair, and open a new chart in the “chart” window. You can easily drag&drop a symbol from the Market Watch onto an open chart in the Chart window, and the current template will be applied to the new currency pair. At the bottom of the Market Watch is a tab called “Tick chart”. If you click on it, you will see the current price activity of the pair tick by tick. To open a position on MetaTrader 4, you can either: 1) click on “New Order” from the “Standard” toolbar, 2) select the pair to trade on the “Market Watch” and right-click, then select “New Order”, 3) or simply press the F9 key at the top of your keyboard. Whatever way you chose, the following window will pop-up (screenshot below). At the top of the window, the selected “Symbol” is shown (you can change it from the drop-down menu). Below, under “Volume:”, you can select the desired position size in lots. One lot equals a position of $100.000, while a volume of 0.01 lots equals $1000. After you select your preferred position size, you can set a stop-loss and take-profit level. It’s always highly recommended to set at least the stop-loss level – the level at which your position will automatically close out to prevent further losses. Select the order type under “Type”, whether it’s a spot order (market execution) which executes at the current price, or a pending order which opens when specific market conditions (usually price) are met. Hit “Sell by Market” or “Buy by Market” and your first position is open! You can see how it is performing under your MT4 “Trade” tab in the “Terminal” window. It is very good of you to take the time to put this piece together for all your beginner followers. I know you are a busy person, I will be bitterly dissapointed if you are not thanked profusely for this post. I know your not printing this for applause, just a fact on my part. In my opinion if traders need help figuring out a platform what chance do they have at real trading ! My hope is that they review your course at least 25 times if their serious. I installed my first trading platform just about a year ago (i checked the installation date, my MT4 is about to celebrate its first birthday some time this week). It was all about trading in my daily after I installed the platform. My friend -Joe- introduced me to trading. He taught me how to trade using his indicators and such, I didn’t realize that there is a curse of cauliflower in trading before colibritrader wrote the article. The trade did not perform as expected, more filter was given by Joe to improve the result. And he kepts adding indicators to me until I think it was impossible to open any position with that many filters and i had to keep watching screen to check many pairs opportunities. So I started to learn from others from the internet. I read several teaching, including colibritrader. It was colibritrader posts enriched my knowledge about trading mostly. Until today, I keep checking on what colibritrader has to say and don’t bother to jump from links to links or even google -i don’t want to fix anything that is not broken-. People should give time to apply colibritrader’s teachings for a while to get what he teaches. If you learn how to golf and you can’t swing long enough because you don’t practice, don’t blame your instructor. As Dan said, everyone must go through stages. First of all- thank you for the great words. It really makes me proud to know that I have helped someone to such a level. As you know- my trading doors are always open for the keen learners and I am willing to help with what I can. Having said that, have you tried the platform already? What is your feedback or questions you might have? I am waiting for your (or anyone else who have tried it already) response. I would like to know how to close multiple positions. FXCM trade station platform allows to select multiple positions and close them together. However, I do not see similar feature in MT4 platform. I am using MT4 platform from FXCM. Let us say, I have 3 open positions. Is there a way to close 2 of 3 positions at the same time.